A range of architectural maquettes by Francis Kéré, Caruso St. John, Barkow Leibinger, and others, demonstrates the breadth of imagination at the exhibition. An architectural exhibition always presents the problem of drawing versus model. With this year’s Chicago Architecture Biennial, curators Sharon Johnston and Mark Lee have put the emphasis on the latter. It feels like that the majority of the works on display inside the Chicago Cultural Center, the biennial’s main hub, take the form of scale models, both small and towering. Here are some of the most memorable contributions. The most memorable, if not outwardly impressive, room of the biennial is actually sparsely populated. The feeling is one of absence, which is picked up by the dark all-over wallpaper. (Designed by Demand, it appears to be creased and textured but was in fact flat.) A giant model collects various projects of Caruso St. John Architects to form a people-less “city” just waiting to be toppled by some science fictional megafauna. Each of the individual blocks, some of which depict projects both real or under construction, is here deprived of any surface detailing. Strange dollhouses indeed. In their contribution to the Chicago Architecture Biennial, Barcelona-based MAIO intentionally omits architecture to highlight the oft-neglected importance of interiors—and the quotidian objects that comprise them. 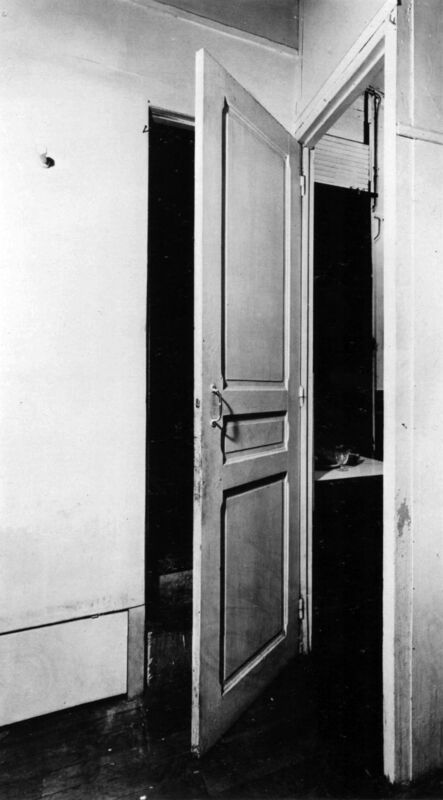 Using a Surrealist door in Marcel Duchamp’s Paris apartment as a literal frame of reference, the architects have set a sprawling, dollhouse-scaled landscape atop a mirror. In the absence of architecture, the viewer is left to consider a sea of tiny, Pepto pink–doused objects—miniature chairs, door frames, a dining table, a toilet, a flat-screen TV, a pool table complete with mini cues—all reflected in the glass below. As a bonus, the mirror also reflects the ornate interiors of the Chicago Cultural Center’s GAR Hall. Fresh on the heels of a coveted Serpentine Pavilion win, Francis Kéré has reimagined Chicago’s Tribune Tower as a monumental, telescope-like skyscraper that, as with the apocryphal Tower of Babel, underscores the importance of communication and unity. Rather than locate structural and mechanical elements in the center, the Berlin-based architect relocates them to the tower’s exterior in three separate cores in order to create an open, column-free interior. The blue model (notably, a similar shade of indigo used in his Serpentine pavilion) contains four distinct segments that have the capacity to unify cultural, work, and residential space in a single building. Through a series of cascading, interconnected interior spaces, the proposal emphasizes human interaction—a thread that has come to define Kéré’s work. In GAR Hall, also dubbed the Plinth Room, 24 architects were given a standard-size surface and let loose to do anything they wanted with it. Cohesion wasn’t the point, and the end results were highly personal. Some designers appear to have been trying too hard to impress, while others struggled with the format’s spatial constraints. Not Angela Deuber, the very talented German-Swiss architect, who seemingly refused to play this little curatorial game at all. On top of her otherwise empty plinth she placed a single column, an abstracted version of the chunky columns found at the Karnak Temple Complex in Luxor, Egypt. There’s perhaps a more nuanced story here, but it felt like a middle finger. “BEST plus Big Box plus Ambasz” is how Ellie Abrons of Ann Arbor–based T+E+A+M sums up Ghostbox. The model repurposes SITE’s most memorable design for the BEST Products Company, its pseudo-ruined 1975 Houston outlet. (The staggered BEST signage has been replaced with a similarly styled T+E+A+M.) But here, the big box is actually ruined. Its dank interiors are cluttered and decrepit, while mounds of aggregate material—crushed asphalt, brick, and concrete—are picturesquely sculpted to recall Emilio Ambasz’s Surrealist follies. It all makes for a deliciously dreary stage dressing. Mexico City–based firm PRODUCTURA blurs the line between architectural sketch and model in their reimagination of the Tribune Tower. Working from some of its earlier designs (including a 2011 competition entry for the design of the Bauhaus Museum in Weimar, Germany), the studio proposes to stack two identical, Mies-inflected towers on top of one another, resulting in a satisfyingly simple gesture. The architects, along with the aid of volunteers, spent weeks coloring each of the skyscrapers 8-foot-tall volumes with red and blue Bic pens—an impressive (and headache-inducing) achievement. In what is one of the largest—and most head scratching—of the biennial’s installations, the Italian architecture collective Baukuh teamed up with photographer Stefano Graziani to create a chapel for an imaginary meeting between famed Italian politician and petroleum king Enrico Mattei (b. 1906) and Biblical badass, the Queen of Sheba. The resulting structure is something of a hybrid between the Eames House and a funhouse: a false front, crawl spaces, and mirrored surfaces create a disorienting architectural experience. Inside the volume’s double-height “chapel” space, minimal line drawings allude to the fictional meeting between Mattei (a post-war proxy for King Solomon) and Sheba. The German and American firm, Barkow Leibinger, contributes three new tower typologies developed to address the pressing need for affordable housing in Berlin. One of the proposals draws from Thicket, a rare 1971 film by artist Robert Smithson and Nancy Holt. Evoking a scene in the film in which Holt passes through a labyrinth of swamp grasses, the firm proposes using bundled wire to create a delicate structure between floor plates. The second proposal also alludes to history, this time to German architect Heinrich Tessenow’s 1936 all-timber pavilion. Barkow Leibinger’s interpretation is a forest-like network of structural columns. The third and final proposal references the firm’s present-day work and experimentation with sculptural walls using lightweight concrete—in the Biennial model’s case, pink foam. Scale figures are whimsically inserted into all three models. A gem of an installation, Super Models reads like a meta-commentary on this biennial’s obsession with the medium. The work, which was realized in conjunction with an exhibition at the Princeton School of Architecture, recreates a gallery in the O.M. Unger–designed German Architecture Museum (DAM). The biennial facsimile is based on photograph from 1984, the year DAM opened, depicting several of the museum’s holdings in a pavilion-like space. In Chicago, just as in the picture, 12 building models by famous architects including Aldo Rossi, Robert Venturi, Hans Hollein, and Frank Gehry are huddled underneath an artificial skylight, like precious works of art. Poor Studio Anne Holtrop. On Thursday, the first day of the biennial vernissage, the Amsterdam and Muharraq–based firm posted two photos on its Instagram account—its contribution had been seized by customs agents en route to the Chicago Cultural Center. When it does arrive, the curvilinear tower design, which riffs on Mies van der Rohe’s 1922 Glass Skyscraper, will be placed inside the cultural center’s atrium, currently inhabited by Atelier Bow-Wow’s 2015 Piranesi’s Circus. (The latter, a vertiginous array of ladders and catwalks, was a holdover from the first biennial.) The two projects will make for quite an interesting pair.